A young writer (Milo Ventimiglia – Heroes, Rocky Balboa) and his wife (Sarah Shahi – Life) are struggling with the loss of their child but just as they are trying to get their lives back on track a hysterical young woman (Sara Paxton – The Innkeepers, Last House on the Left), turns up at their secluded house in the middle of the night, claiming she is being chased by mysterious masked men. Letting her stay the night, the couple are soon drawn into the horror when the unknown force starts to stalk them. A terrifying game of cat and mouse ensues, resulting in a shocking conclusion and one of the most chilling film finales of recent years. Or so we are assured. Static is the first feature from director and co-writer Todd Levin and is so spanking new that you'll be pushed to track down many reviews at present, although Scream Magazine called it, "One of the best horrors we’ve seen in years," and "truly frightening." What has emerged is that its original title was Static 3D, and that's not some coded use of the numeral, but an indication that it was shot in 3D and presumably intended to be released that way. Not that we care – we're not big on the whole 3D here, but if you do have a fixation for the process you might feel a bit miffed that it's getting a 2D only DVD release over here. 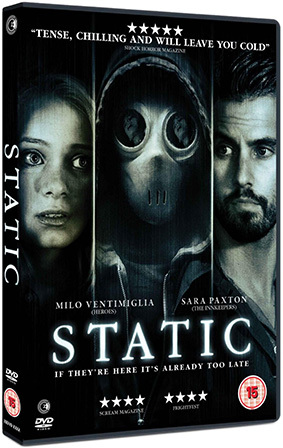 Anyhoo, Static will be released in the UK on regular DVD on 15th July 2013 by Second Sight at the RRP of £15.99.